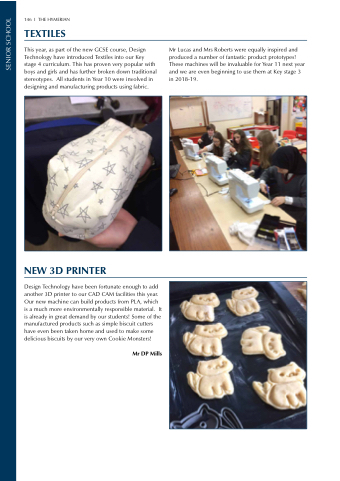 This year, as part of the new GCSE course, Design Technology have introduced Textiles into our Key stage 4 curriculum. This has proven very popular with boys and girls and has further broken down traditional stereotypes. All students in Year 10 were involved in designing and manufacturing products using fabric. Design Technology have been fortunate enough to add another 3D printer to our CAD CAM facilities this year. Our new machine can build products from PLA, which is a much more environmentally responsible material. It is already in great demand by our students! Some of the manufactured products such as simple biscuit cutters have even been taken home and used to make some delicious biscuits by our very own Cookie Monsters! Mr Lucas and Mrs Roberts were equally inspired and produced a number of fantastic product prototypes! These machines will be invaluable for Year 11 next year and we are even beginning to use them at Key stage 3 in 2018-19.